The deadly bombings in Russia over the past two days should be a wake-up call to “how evil Islamic terrorists can be,” and are deeply troubling for the impending Winter Olympics, U.S. Rep. Peter King says. “This shows again how dangerous Islamic terrorists are . . . It was a brutal attack, and it shows just how devastating they can be,” King, R-N.Y., told “The Steve Malzberg Show” on Newsmax TV. “With all the security that Russia has . . . if they could attack there, you can imagine what they can do here. This really should be a wake-up call to all of us about how deadly, how diabolical, and how evil Islamic terrorists can be and are,” he said Monday. King, chairman of the Homeland Security Subcommittee on Counterintelligence and Terrorism, said Olympic officials must be vigilant in providing security. “I don’t want to be scaring people, but anytime you have active terrorists, you have to be concerned,” he said. On Monday, a suicide bomb killed at least 14 people in the southern Russian city of Volgograd, just a day after an explosion at Volgograd’s main train station killed 17 people and wounded at least 35. Russian authorities have declared both bombings terrorist attacks. “This story is totally misleading, untrue. First of all, the headline saying al-Qaida was not involved — Ansar al-Sharia [one of the local groups] is affiliated with al-Qaida,” he said. “[They want to take the] issue away from Republicans no matter who the Democratic nominee is. Whether or not it’s Hillary Clinton, they want this issue taken away, and it’s part of a systematic effort here,” he said. A police officer with a sniffer dog and security guards check a bus entering the Olympic Park in Sochi, Russia. “Concerning the Olympic Games in Sochi, all necessary security measures are provided for, and extra security measures in light of the act of terrorism in Volgograd will not be taken, because everything needed is done,” he said. Russian President Vladimir Putin for his part has ordered tighter security nationwide but has not addressed the attacks publicly. The second attack in Volgograd — formerly known as Stalingrad — killed at least 14 and injured 28, when an explosion ripped apart a trolley bus, one day after an explosion killed at least 17 people in the city’s main rail station. Vladimir Markin, spokesman for the Russian Investigative Committee, said the bomb used was packed with shrapnel that was “identical” to that in the rail station bombing and was set off by a suicide bomber, reports Russia Today. Sergey Avdienko, a retired police colonel and former Interpol officer, told the network that the attacks were carried out by Islamic militants from the volatile North Caucasus. “It’s quite clear who is behind these attacks — it’s people from a place fairly close to Volgograd; I’m speaking about the Caucasus, where radical Islamic groups thrive. The entire point of doing this, especially on the cusp of the New Year, is to intimidate the population and to destabilize the situation in the country as well, particularly in view of the coming Olympic Games,” he said. Volgograd, about 400 miles northeast of Sochi, is a key transport hub for the region. In July, Doku Umarov, head of the Caucasus Emirate, considered to be a terrorist organization by the State Department, vowed to target Sochi explicitly, calling the games ”satanic,” reports CNN. ”They plan to hold the Olympics on the bones of our ancestors, on the bones of many, many dead Muslims, buried on the territory of our land on the Black Sea, and we Mujahedeen are obliged not to permit that — using any methods allowed us by the almighty Allah,” he said in a video statement. Umarov was a rebel leader in Chechnya’s separatist fight in the early 1990s, which evolved into an Islamic insurgency that has spread through neighboring Muslim republics, including Dagestan. The Russia Foreign Ministry on Monday likened the Volgograd bombings to “terrorist attacks” in the US, Syria or elsewhere, organized by groups with the “same motivator,” and expressed “deep appreciation” to all world leaders who condemned the attacks, according to RT. The White House also issued a statement saying President Barack Obama had been briefed on the situation and that the U.S. and Russia were cooperating on anti-terrorism leading up to the Olympics. Putin’s silence as his pet Olympics project appeared in danger of being thrown into chaos was seen as surprising. “Putin may be hesitating to speak out because any alarmist statements from him might indeed cast doubt on the security of the Olympics at Sochi, which is much closer than Volgograd to the terrorist hotbeds of the North Caucasus,” Leonid Bershidsky, an editor and novelist, wrote in Bloomberg View. “Security is already extra tight at the Olympic venue, and law enforcement chiefs know Putin won’t forgive them for allowing anyone to mess with an Olympic showcase that has cost $48 billion to stage,” he added. But the bombings are having international repercussions. Australian Foreign Minister Julie Bishop said the country could pull out of the games. “We don’t want to lightly prevent our athletes participating in any event for which they have trained for years, but their safety and the safety of their families and other spectators is of the utmost concern,” Bishop told The Australian newspaper. The 22nd Winter Olympics are due to begin in Sochi on Feb. 6 and run for 17 days. The city was chosen as host in 2007, despite fears of violence from groups linked with the independence moves in the nearby republics. In 2010 Time Magazine raised fears that Sochi, a resort town on the Black Sea near the Russian border with Georgia would be safe, citing at least four groups that could set of a bomb in a crowded square in broad daylight. “We are preparing to hold the Games in what is virtually the front line in our war on terrorism,” said former KGB Col. Oleg Nechiporenko, chief analyst for Russia’s National Anti-Terrorist and Anti-Criminal Fund. Authorities say 37 people were killed and 67 were injured in Baghdad on Christmas when three bombs went off near a church and Christian village. Fox News contributor Lisa Daftari sat down with Kelly Wright this morning on Fox and Friends to give us her take on the increasing number of attacks on Christians throughout the Middle East. A U.S. government contractor kidnapped by al Qaeda more than two years ago appeared in a new video making a desperate plea to President Obama. Warren Weinstein, 72, was abducted in August 2011 in Lahore, Pakistan, where he was working for a U.S.-based firm that advises Pakistani businesses. He said in the video he feels “totally abandoned and forgotten,” telling Obama that he can make “hard decisions” now that he does not have to worry about re-election. The video of Warren Weinstein was the first since two videos released in September 2012. Weinstein, the country director in Pakistan for J.E. Austin Associates, a U.S.-based firm that advises a range of Pakistani business and government sectors, was abducted from his house in the eastern city of Lahore in August 2011. In the video sent Thursday to reporters in Pakistan including The Associated Press, Weinstein called on the U.S. government to negotiate his release. The video and an accompanying letter purported to be from Weinstein was emailed anonymously to reporters in Pakistan. The video was labelled “As-Sahab,” which is al-Qaeda’s media wing, but its authenticity could not be independently verified. The letter was dated Oct. 3, 2013 and in the video Weinstein said he had been in captivity for two years. In the video, Weinstein wore a grey track suit jacket and what appeared to be a black knit hat on his head. His face was partially covered with a beard. Al-Qaeda has said Weinstein would be released if the U.S. halted airstrikes in Afghanistan, Pakistan, Somalia and Yemen and also demanded the release of all al-Qaeda and Taliban suspects around the world. The White House has called for Weinstein’s immediate release but has said it won’t negotiate with al-Qaeda. The videos last year showed Weinstein appealing for help from the Jewish community and Israel’s prime minister. The connection between Saudi Arabia and the September 11 terror attack has been the subject of much debate, particularly the involvement between the hijackers (15 of whom were Saudi nationals) and the Saudi government and royals. That connection has always been thought to be outlined in 28 pages of a report to the Joint Intelligence Committee Inquiry of the September 11 attack that were redacted when the report was issued (in 2002 under the Bush administration) and remain so today. However, two members of Congress, who were recently given access to the backed-out section are now pushing President Barack Obama to declassify the pages. Reps. Walter B. Jones (R-N.C.) and Stephen Lynch (D-Mass) have introduced a resolution in Congress urging President Obama to open up the report for public scrutiny. At the time the report was issues, then-President George W. Bush said the pages were censored for national security reasons. After reading the pages, Jones says he see no reason the pages should be kept from the public. Graham also agrees that opening up the pages to public scrutiny would not violate national security. Jones and Lynch are now urging all members of the House to read the redacted pages and join them in their effort to bring the information to the public sphere. A British royal is making headlines for outspoken comments about the Middle East. Prince Charles recently said Islamic militants are driving Christian out of the region. Islam’s goal is to take over America and install sharia law. Other groups are forming “Chrislam” – a combination of Christianity and Islam. LTG (Ret) Jerry Boykin was one of the original members of the US Army’s Delta Force. He was privileged to ultimately command these elite warriors in combat operations. Later, Jerry Boykin commanded all the Army’s Green Berets. He has participated in clandestine operations around the world. Lt. Gen. (Ret.) W.G. Boykin discusses how Islamic Shariah Law is in basic conflict with the Constitution of the United States. This effort to implement Shariah Law in the United States is in basic conflict with the foundations our nation was built upon and represents a serious threat to which we must respond. A timely and powerful documentary presenting the danger posed to the free world by a nuclear Iran. The film exposes the radical Islamic ideology guiding Iran’s leaders, and the destruction and suffering it has already caused. 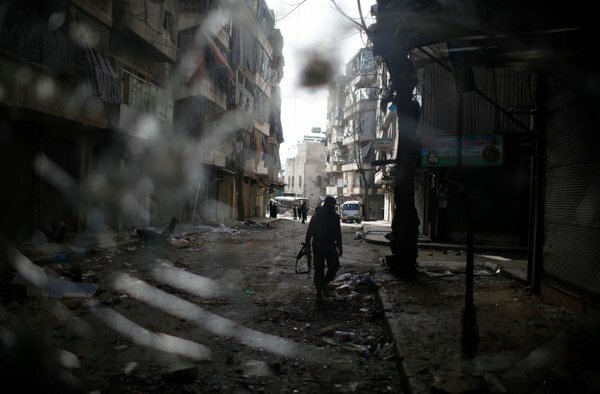 An Islamist fighter roamed through Aleppo, Syria, last December. Infighting among jihadist groups has recently mitigated their threat there, but that may not last. WASHINGTON — Intensifying sectarian and clan violence has presented new opportunities for jihadist groups across the Middle East and raised concerns among American intelligence and counterterrorism officials that militants aligned with Al Qaeda could establish a base in Syria capable of threatening Israel and Europe. The new signs of an energized but fragmented jihadist threat, stretching from Mali and Libya in the west to Yemen in the east, have complicated the narrative of a weakened Al Qaeda that President Obama offered in May in a landmark speech heralding the end of the war on terrorism. The leaders of the Senate and House intelligence committees, Senator Dianne Feinstein of California and Representative Mike Rogers of Michigan, raised warnings in an interview on CNN on Sunday when they said that Americans were “not safer” from terrorist attacks than they were in 2011. The concerns are based in part on messages relayed this year by Ayman al-Zawahri, Al Qaeda’s overall leader, indicating that he views Syria — where the number of jihadist rebels and foreign fighters is steadily rising — as a promising staging ground. Some analysts and American officials say the chaos there could force the Obama administration to take a more active role to stave off potential threats among the opposition groups fighting against the government of President Bashar al-Assad. But striking at jihadist groups in Syria would pose formidable political, military and legal obstacles, and could come at the cost of some kind of accommodation — even if only temporary or tactical — with Mr. Assad’s brutal but secular government, analysts say. It is not clear whether or when the White House would be willing to make such an abrupt shift in approach after years of supporting the Syrian opposition and calling for Mr. Assad’s ouster. It would certainly require delicate negotiations with Middle Eastern allies who were early and eager supporters of Syrian rebel groups, notably Saudi Arabia. One growing source of concern is the number of Muslims from Western countries who have gone to fight in Syria and might eventually return home and pose a terrorist threat. Analysts say at least 1,200 European Muslims have gone to Syria since the start of the war to join the fight, and dozens of Americans. Across the region, a rising tide of Islamist militancy — fueled partly by sectarian violence and partly by the collapse of Egypt’s Muslim Brotherhood in the face of opposition from the country’s military — has contributed to a recent wave of attacks, including deadly bombings in Lebanon and the Sinai Peninsula as well as the daily carnage in Syria and Iraq. The violence has underscored the continuing disarray across the Middle East in the wake of the 2011 Arab Spring uprisings. Above all, it is the chaos of Syria, where foreign jihadis appear to be building to a critical mass and have overwhelmed the Western strategy of support for the moderate opposition, that could drive the Obama administration toward greater involvement, analysts say. But it is not at all clear what form that involvement might take. American officials are unlikely to open a new front of drone strikes in Syria. Other options carry large risks. In early October, American commandos carried out raids in Libya and Somalia aimed at capturing terrorist suspects. The Libya raid was successful; the one in Somalia was not. To some extent, infighting among the jihadist groups in Syria has recently mitigated the threat there, but it is not clear how long that will last. Mr. Zawahri sent an envoy, Abu Khalid al-Suri, in an effort to resolve disputes between the two main factions, the Nusra Front and the Islamic State of Iraq and Syria. Those agendas can easily overlap and change, and one place where that appears to be happening is Yemen, the home to Al Qaeda’s most organized and threatening affiliate. A series of clashes in the past month between Zaydi Muslim militia fighters and hard-line Sunnis in Yemen’s remote northwest has led to calls for a wider religious war, and there are reports of training camps being established for that purpose, Yemeni officials say. In Yemen, as in Syria, this sectarian dynamic may appear to divert the militants’ attention away from the West. But the accompanying radicalization and militancy creates “the perfect environment for Al Qaeda” in a country where the terrorist group already has a strong foothold, said one Yemeni official. Even as an American drone campaign continues to kill people suspected as militants in Yemen, the Qaeda affiliate based there gained at least $20 million in ransom payments earlier this year from the governments of Qatar and Oman, which paid to free two groups of European hostages, according to American and Yemeni officials. That is enough to fuel their operations for years, the officials said. A string of recent deadly attacks on Yemeni military targets has also made clear that Al Qaeda “has infiltrated our security services” to a greater extent, the Yemeni official said. In one of those attacks, a band of six jihadists disguised in army uniforms commandeered a military post with dozens of soldiers inside and held it for three days, repelling repeated efforts to free the men. In addition to the rising number and deadliness of attacks, there are signs of possible cross-pollination among some of the jihadist groups around the region. American officials say that the Yemen-based Al Qaeda affiliate, Al Qaeda in the Arabian Peninsula, has regular contact with jihadist groups in Lebanon and in the Sinai Peninsula, where there have been near-daily attacks since the Egyptian military ousted the Islamist president Mohamed Morsi in July. Despite extensive Egyptian military efforts to confront them, the Sinai militant groups remain strong and have powerful new weapons — including surface-to-air missiles that could take down airliners — obtained from Libya after its civil war, said Ehud Yaari, an Israel-based security analyst for the Washington Institute for Near East Policy. The disarray in Libya, where the weak transitional government is largely hostile to the nation’s fractious militias, is also a source of increasing concern. Terrorism analysts say southern Libya has become a safe haven for a range of jihadists. “All of our regional partners are very afraid of the instability they see emanating from southern Libya,” said Maj. Gen. Patrick J. Donahue II, the commander of American Army forces assigned to Africa. Other extremist groups are redoubling their efforts across Africa. Last month the State Department branded Boko Haram, the homegrown Islamist insurgent movement in Nigeria, as a foreign terrorist group. Its attacks have left thousands dead in a decade. In article on Wednesday about challenges the Obama administration faces because of the rising jihadist threat across the Middle East misidentified the militant group that released four French hostages in October for a reported ransom of over $27 million. It was Al Qaeda in the Islamic Maghreb, not Boko Haram.